The B136-100 is a remote extender unit for the B136-004 4-Port Component Video + Stereo Audio Extender/Splitter. A 1080i(60Hz) Component Video and Stereo Audio signal can be extended up to 91 m (300-ft.) when using 24Awg, Solid Wire UTP cable(Tripp Lite N202-Series); or, up to 122 m (400-ft.) when using Zero-Skew UTP cable(Tripp Lite P524-01K). A 480p(60Hz) Component Video and Stereo Audio signal can be extended up to 152 m (500-ft.) when using 24Awg, Solid Wire UTP cable(Tripp Lite N202-Series); or, up to 213 m (700-ft.) when using Zero-Skew UTP cable(Tripp Lite P524-01K). 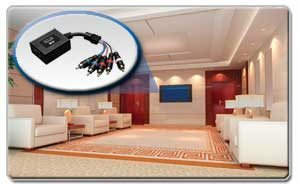 Plugs directly into the TV's Component Video and Stereo Audio ports...no external power required. Extend a 1080p Component Video and Stereo Audio Signal Up to 300 ft. Spread your message far and wide—extend a Component Video with Stereo Audio signal up to 700 feet! When used with Tripp Lite's B136-004 Component Video with Stereo Audio over Cat5/6 Extender/Splitter, this remote receiver unit delivers peak video and audio performance, assuring that you enjoy a crystal-clear picture and full, rich sound. With 24 Awg Solid Wire cable (Tripp Lite N202-series), the unit can extend a 1080p (60HZ) signal up to 300 ft. and a 480p (60HZ) signal up to 500 ft. Using Zero-Skew UTP cable (Tripp Lite P524-01K) allows for a distance of 400 ft. at 1080p (60HZ) and 700 ft. at 480p (60HZ). The included hardware provides you with a variety of installation options and the plug-and-play convenience makes for an easy, efficient setup. The B136-100 receives a Component Video with Stereo Audio signal from a Tripp Lite B136-004 splitter, making it the ideal solution for digital signage applications requiring many displays connected to one source, ranging from retail and point-of-sale displays to trade show presentations. The unit plugs directly into the remote display, eliminating the need for extra cables and simplifying the installation process. The B136-100 allows for the video and audio sources to be in a secure, remote location for controlled access while still delivering signal to devices in another area. This Tripp Lite Component Video with Stereo Audio over Cat5/6 Receiver allows extension of a high-quality digital video and audio signal beyond normal cable distances. The unit receives a signal from a Tripp Lite B136-004 splitter. When used with 24 Awg Solid Wire cable (Tripp Lite N202-series), the B136-100 can extend a 1080p (60HZ) signal up to 300 ft. and a 480p (60HZ) signal up to 500 ft. Using Zero-Skew UTP cable (Tripp Lite P524-01K) allows for a distance of 400 ft. at 1080p (60HZ) and 700 ft. at 480p (60HZ). And, we haven't forgotten the sound! The B136-100 is compatible with stereo audio, delivering premium sound quality to every point of your application. With no software or drivers to install, the B136-100's plug-and-play setup gets your application up and running faster. Simply connect the unit to the transmitter (Tripp Lite B136-004), connect the remote receiver directly to the HD display and watch as the B136-100 provides crystal-clear resolution. The direct plug-in design of the B136-100 eliminates the need for extra component cables and simplifies the installation process. The B136-100 is compatible with all digital video sources and all computer operating systems. The B136-100 includes mounting hardware enabling it to be installed in any venue. Mounting options include wall-mount, rackmount and pole mount. For further flexibility, up to three units can be mounted in 1U of rack space using Tripp Lite's B132-004-RB 19-inch rackmount bracket. For your peace of mind, the B136-100 comes backed by a 1-year warranty. The B136-100 is also compliant with RoHS (Restriction of Hazardous Substances) standards, reflecting Tripp Lite's commitment to environmental responsibility.